We’re still developing the food and wellness vernacular here at Rockhill House Estate. The idea behind it is both energising & liberating and we have waited a long time to get the opportunity to engage in such a process and now that we have we are striving to invest in good, honest practical, passionate and likeminded people, to give them the tools to do their jobs and the confidence to let them run with it. We are trying to build our food base on authentic great food produce much of which is home grown, home produced & local. That’s one of the foremost thing’s we think about every day. It’s a different kind of pressure because we are still figuring it all out. The regions along the Wild Atlantic way share not only a terrain with us here in Donegal but a way of life based on small farms, lack of real significant urban concentrations (and distractions), and most important, without over romanticizing an intangible spirit of self-sufficiency unmatched by other cultures. At Rockhill we believe our food should be a reflection of us. Every aspect of dining at Rockhill is inspired and shaped by the people, the landscape and the climate here in Donegal, on the edge of Europe At our fingertips, we have all the bounty of the wild salty sea, herb-scattered outcrops, hedgerows heavy with fruit and loam soils loaded with juicy vegetables. 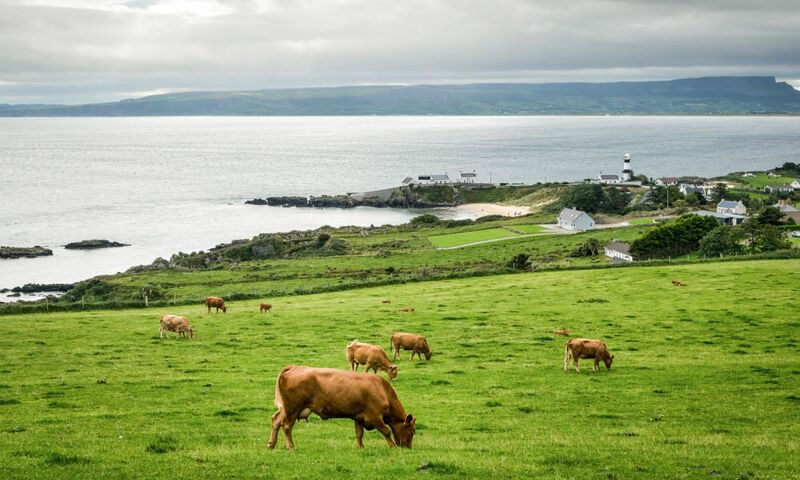 North Donegal is also one of the best traditional dairy farming regions in Ireland – clean and unspoilt with ideal soil and fresh, misty rain producing the lush green grazing pastures that make for the very purest grass-based milk. It is this natural alchemy that gives us at Rockhill our award-winning dairy products from our own creameries, Green Pastures Donegal and Natural Dairies. We draw on these and (something something local knowledge) to create a food culture that is exceptional and impressive. This deep appreciation for the gifts our local area has to offer is carried far beyond the plate. Sustainability is intrinsic to what Rockhill is all about – we value & want to keep the best Irish traditions around food: wholesome; unprocessed; home grown, home produced or locally produced where possible; true to the land (or dúiche in Irish) and the seasons. We strive to ensure our precious environment is nurtured, protected and fortified; bringing back the honey bees that are thronging to our bee hives; re-introducing native partridge, planting rare native fruit trees in the long untended Walled Garden, and our little clutch of hens who could hardly be happier in their home as they busily produce eggs for our daily breakfasts (which guests are welcome to collect each morning, should they wish!). These elements and more allow us to provide a true taste of Donegal and the North West Of Ireland, evident in the colours, textures, aromas and tastes that arrive on your plate. Whether it is an intimate private gathering in the Stewart Dining Room, a hearty Banquet in the Orangerie where the exposed sparkling grey rockface is an appropriate signature to our Rockhill house name you’ll enjoy delicious wholesome, healthy, well-sourced Irish farm and sea foods prepared with culinary care, skill and style. You’ll be refreshed by carefully paired and chosen wines and expertly mixed cocktails. You’ll be relaxed and cheered by the atmosphere in our beautiful, historic dining rooms and cared for by our friendly & dedicated staff. So we trust that you will in time find the opportunity to visit & support us and observe the changes as they occur as we say here “All in good Time” ! Go raibh do ghreim blasta – or, Bon appétit!